Brad Argent (Ancestry) gave a talk in October at the Central Library on DNA. The talk came after the Family History Expo in Auckland, and was focused on the science of identity. As Brad said, DNA testing is no longer "just" a tool to help you work out your family history. It is so much more than that and it brings with it potential issues. Does the absence of something in you change who you are, and how you see yourself? For example, if you grew up in a Māori community, and saw yourself as Māori, then get a genetic result back that says you're not Māori... do you stop being Māori overnight? He talked about the memetic self - that is, the part of you made up of those "things" passed down to you through your culture, your family, and the family stories. What, he asked, happens when you've grown up hearing stories but learn you are not biologically connected to them? Do they just go away? 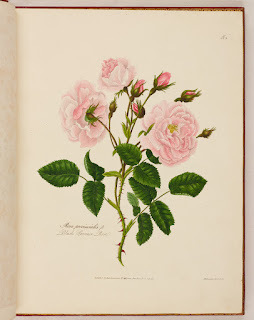 In 1799 a young woman called Mary Lawrance completed a 3 year-long project, a self-published book on roses, with all the 91 copper plates depicting varieties of roses etched and hand-coloured by herself. Ref: Mary Lawrance, A collection of roses from nature, 1799, Sir George Grey Special Collections, Auckland Libraries, 1799 LAWR. 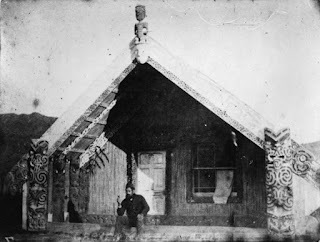 It was purchased for Auckland Libraries in 2014 by the Mackelvie Trust, a charitable trust that supports J.T. Mackelvie’s bequest of art and decorative arts to the city. A luxurious book, it is one of the highlights in the current exhibition Old and new, showing until 28 February 2017 at the Central Library. Continuing our series on Family History - the best of 2016. Here's Maata, our Māori Reference Librarian, with her "best of." The above Māori proverb describes my recent experience as a new staff member at Te Kohinga Rangahau o Tāmaki Makaurau - Auckland Research Centre, aptly. Albeit perplexing at times, my seven months navigation of the research centre and its environs, the nearby stacks, the library basement and the Sir George Grey Special Collections has been very rewarding. One of the highlights of 2016 for me was the discovery of HMS Terror in the Arctic. The Terror was sister ship to HMS Erebus and both sank in the 1840s while on an exploration voyage to find the North-west passage. 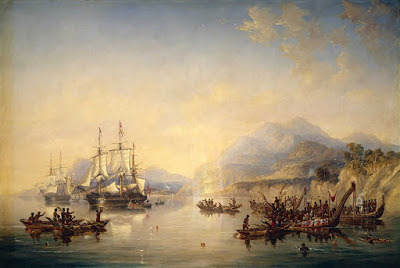 While it is thought that they came close to discovering the passage, it was the subsequent voyages that went in search of the lost ships that mapped much of Upper Canada and the Arctic Circle.